"Alternative world views" are all the rage at Evergreen State, where "hippies, hippies, and white guys with dreadlocks" ponder how to change the world and life's most mind-boggling problems. Students design their own majors with the guidance of "highly qualified" professors all throughout their academic careers. Instead of traditional grades, students receive narrative evaluations." Describe the type of student who should not attend The Evergreen State College and explain why. Describe the type of student who should attend The Evergreen State College. Why? In my view, Evergreen is best for students who have eclectic interests and genuinely want to pursue all of them. What is a typical The Evergreen State College student like? Describe the type of person that should attend The Evergreen State College. Evergreen students are very open minded. They are passionate about pushing back against systems of oppression. Evergreen students are self motivated and go on to create their own organizations. What are the top 3 reasons someone should attend The Evergreen State College? It is a diverse school. It is a great place to learn from people and help each other grow. You get to practice how to talk to people about your opinions in seminars. What was a typical The Evergreen State College student like in high school? Describe the type of person that should attend The Evergreen State College. Honestly the typical Evergreen student was the kid who always had a rant on something they believe in just waiting for a chance to let it out. Evergreen's interdisciplinary, team-taught curriculum is truly unique. Does not give out grades...students receive evaluation narratives by professors. Evergreen places a lot of credence in character and personal qualities when making admissions decisions. Since opening our doors in 1971, Evergreen has established a national reputation for leadership in developing innovative interdisciplinary, collaborative and team-taught academic programs. We have a vibrant undergraduate program, a graduate program, and public service centers that constitute a unique academic setting. 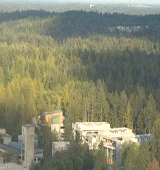 The Evergreen State College is accredited by the Northwest Commission on Colleges and Universities (NWCCU). Evergreen values a student-centered learning environment, a link between theory and practice, and a multicultural community of diverse faculty, students and staff working together. Current enrollment is approximately 4,900. What are the top 3 things that students do for fun at The Evergreen State College? Students like to attend workshops/panels or host their own. Students like to create art. Students care about social justice. Campus housing is available for undergraduates. Housing deposit : $250.00. Housing deposit due : Jul 12. Housing deposit is not refunded if student does not enroll.. Freshman allowed to have car. No pets. 20% of students live on-campus. 80% of freshman live on-campus. 57% of students graduated in the top half of their class. 30% of students graduated in the top quarter of their class. 13% of students graduated in the top tenth of their class. The average student pays $13,147 for tuition, fees, and other expenses, after grants and scholarships. Total stated tuition is $7,833, in-state and on-campus, before financial aid. Learn more about financial aid at http://www.evergreen.edu/financialaid/. Estimate the net price for you at http://www.evergreen.edu/financialaid/calculator. The typical (median) early career salary of The Evergreen State College graduates is $39,600, according to Payscale. The Evergreen State College participates in the NAIA Division II for college athletics. Want more info about The Evergreen State College? Get free advice from education experts and Noodle community members.